You can now buy the very latest album by Geoff Smith - That's Gravity featuring 9 great songs as a podcast which you get delivered directly to iTunes and then you can easily sync the content onto your iPhone, iPod or similar devices. The songs are delivered in mp3 format encoded with a bitrate of 256 kbit/s and all the songs are DRM free. You will also be able to download the songs, videos and the other bonus material from the download area so you can easily import it into the music management program of your choice. This is not a traditional album - this is a Dynamic Album and only available via RingtoneFeeder which means you will continue to receive bonus material for 12 months after the release date. Bonus material will be released every month and will include: Music videos, live appearances, acoustic versions, exclusive tracks, ringtones etc. If you are already a registered user, simply log in to the Members Section and select the "That's Gravity" album from the Add/Renew subscription area otherwise just click the button below to register and buy the album - you do not have to be a RingtoneFeeder subscriber to buy the album. What is included in the Dynamic Album? Since this album is distributed as a feed we will be able to add additional features even after the album has been delivered. Below an overview of the content of the feed you will receive immediately upon completion of the payment and you will then be receiving updates to the Dynamic Album every month or so for 12 months after the release date (November 2010). How can I get the songs into my Music folder in iTunes? What is it with that code? Since it is DRM free can I then share it with my friends? I only received one song - how do I get the rest? What about bonus material if I buy the Dynamic Album later? Can't I just buy a normal album? What if I loose the album? Why is RingtoneFeeder geting into music distribution? 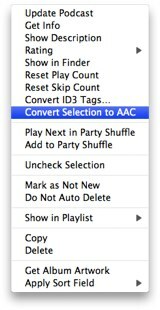 The easiest way to add song(s) to your music library in iTunes is simply to right-click on the song(s) and select "Convert Selection to AAC" and once the conversion is completed the selected music will be automatically copied to your Music library. 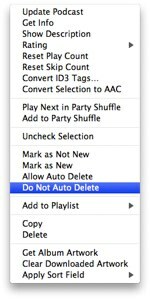 You can of course also reveal the song(s) in Finder (or Windows Explorer) and then use your favorite audio conversion tool to change the mp3 into the format you prefer and then import it into your preferred music management program. No, free of DRM is not free of copyright protection and it does not give you the right to re-distribute all or parts of the content you have purchased to the world or your friends and family for that matter. In iTunes you just need to click the "GET ALL" button as illustrated below and the songs and extra material will start downloading. Alternatively You can just click "GET" button next to the item you want if you do not want to get all the items. You can buy the album anytime you like and you will get all bonus material released at the time and all future updates. The only thing you will miss out on will be the live USTREAM shows exclusively for Dynamic Album owners. Yes, you will be able to buy a "traditional" album as well as individual songs on iTunes, Amazon and CDBaby where you can also buy the actual CD if you prefer that. The pricing will be in line with the typical SRP. It is always a good idea to back up your files. Having said that, unlike most other music services you will be able to download the album again and again from our site in case you lost the files (or your entire machine). You can either download iTunes for free for both Windows and Mac - or if you do not want iTunes you can try to subscribe in your favorite RSS reader or Music Management software if it supports Podcast. Alternatively you can download the tracks and the extra material manually from the Download section one you have completed the payment for the Album. Make sure you check every other week for the updates. We like to experiment and the ringtones we are doing are all music based anyway so we thought it would be cool to use the same subscription vehicle to distribute an entire album and to keep updating an album long after it has been released including unique ringtones of course. Some users have their podcasts automatically purge after listening to them and would like to move the songs from podcast to music once received. The easiest way to do that is to download the songs you want to keep. 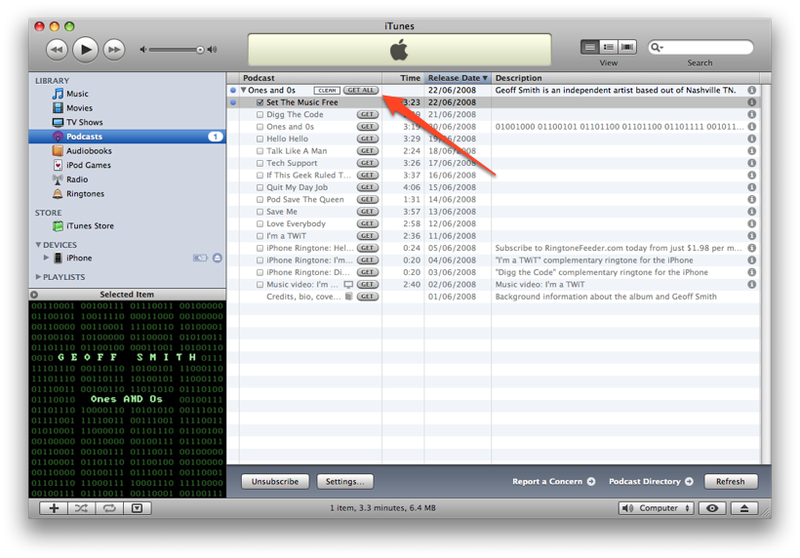 Once the files are downloaded to your computer you can copy them to iTunes or your favorite media software where they will remain even if you delete the podcast feed. If you would like to keep all the content in your podcast feed you can override the global settings by right-clicking the Ones and 0s Podcast and select the "Do not Auto Delete" as illustrated on the right.